The picture was the best part. I think one of the main considerations when eating a cheese steak is the ability actually eat the sandwich without making a terrible mess that requires a fork. Although other factors such as the quality of the meat, the freshness of the bread and the overall flavor are very important, I believe it is instrumental that you should actually be able to eat the damn sandwich in the intended manner. After the first bite of my Stack'd II cheese steak I was left with a disastrous puddle of meat and sauce. Now, this wasn't a huge issue for me as I was happy to shovel the pile of gross into my face. However, having to eat your cheese steak with a fork really detracts from the overall experience. 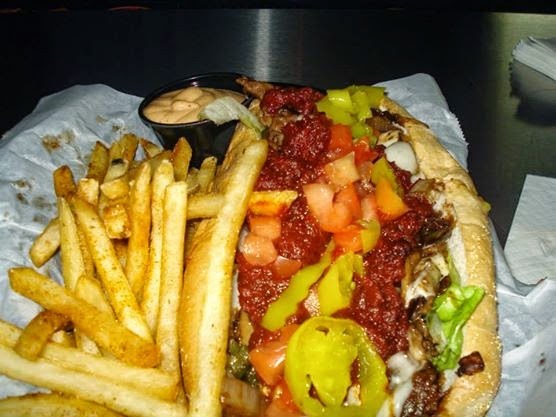 Part of the art of the cheese steak is appropriately balancing the ingredients in a manner that allows for proper sandwich consumption. The great thing about Stack'd II is that they allow you to design your own cheese steak with a wonderful little selection card. The bad thing about Stack'd II is that I'm apparently not very good at designing cheese steaks. I went with the Amoroso roll, grilled onions, mushrooms and peppers, steak sauce, provolone cheese, banana peppers, tomato, lettuce and pizza sauce. Score card for making sammies. Although I love the concept behind Stack'd II, I think the execution needs some fine tuning. I would still recommend that you stop by for happy hour. They offer a HALF OFF EVERYTHING special! Yes, it includes shots.